You are currently browsing the tag archive for the ‘gold’ tag. This painting of Ellen Terry and Henry Irving as Beatrice and Benedict in Shakespeare’s Much Ado About Nothing in 1882 is from The Library of Congress and enchanting in its own right. The background is a blend of the interior of The Great Exhibition at Crystal Palace in 1851 from an old encyclopaedia — the venue was originally constructed in Hyde Park and the exhibition was organised by Prince Albert and Henry Cole — and textures from 2 Lil’ Owls. As soon as I layered the actors over the blended background, it conjured up the likes of William Morris and Dante Gabriel Rossetti! Will you be surprised to learn that Manuscript Abstract is not what I intended when I set out? If you’re a regular visitor, I think not. I was actually trying to do something splendid with a yellow rose, which turned out so un-splendid that I scotched it and went in a completely different direction. That rose is still in there but I don’t think you’ll find it! 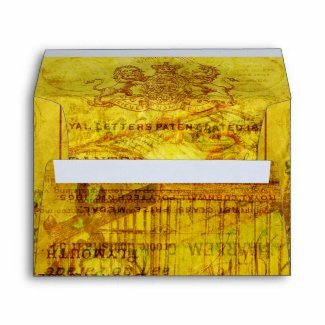 Inspired by my love for green and gold, Manuscript Abstract combines textures and backgrounds with a vintage postcard and sheet music from The Graphics Fairy. I’ve been creating another collage with another beautiful piece of clip art from The Graphics Fairy! On this occasion I added various layers of vintage documents to Karen’s beautiful birdcage image and played around with colours and blending until I came up with Golden Tweets. I’m sure I was subconsciously inspired by getting to grips with Twitter in the last couple of weeks! I’m currently putting it onto various products in my Zazzle gallery so do take a look. Though I ‘say it myself as shouldn’t’, it does look rather delicious on an envelope!